This Riva Ferrari only found it’s first registered owner in 1997 and is one only 9 Specials built, with improved propeller location and shaft angle as well as a swim platform. The Riva Ferrari was the brainchild of Gino Gervasoni, Chairman of Cantieri Riva and Enzo Ferrari. 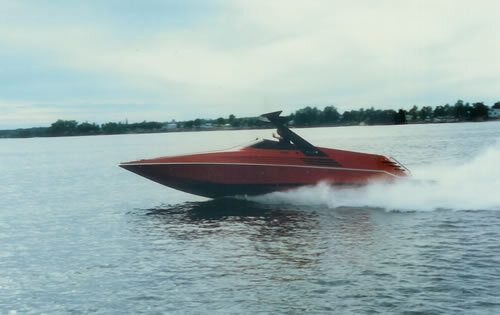 The Ferrari computer aided design (CAD) team worked in conjunction with the Riva engineers and designers to produce a sleek, fast luxurious speedboat that conveyed it’s famous family lineage immediately. The Testarossa style air intake and the Formula One spoiler and the unmistakable Riva hull lines and configuration blend together perfectly. The pilot and forward passenger seats are a wrap-around bolster type with bottoms that fold down to allow use while standing or sitting. Each front seat has a fold out molded fiberglass drink tray. With a 2 shelf locker on each of the cockpit, there is plenty of storage for nautical gear. Aft of the driving station is a bench seat which can seat up to three people comfortably. The 410 HP V8 BPM (true hemis) motors are located under a large hatch in the sun deck and are in perfect condition, ready to propel the boat to a full speed of 54 knots in no time at all. As with all Riva boats, only the best machinery is used; BPM motors, Borg Warner transmissions, Rolla props, and Riva/VDO instrumentation. 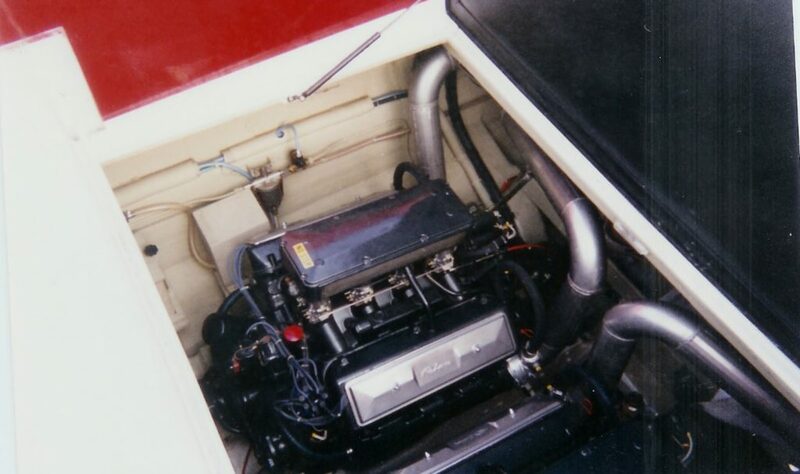 Aft of the engine compartment is a lazarette area for additional stowage. A hydraulically operated swim ladder, mounted in the transom, reveals a fresh water shower hose when open. A cuddy cabin located below decks has ample berthing for 2 people, overhead hatch, concealed marine toilet, and many stowage spaces. The upholstery is in light gray suede with deep blue cabinetry and the vee berth mattresses are in a dark red lightly textured cotton blend. A Clarion AM/FM/CD, with dash mounted remote control, provides music through Polyplaner 80W speakers. Included with the boat is a custom 2005 Rocket tri-axle trailer.